After the success of my 10 of the best independent coffee shops in Plymouth post I thought it was about time I did the same for breakfast places in Plymouth! After all, who doesn’t love a good leisurely brunch on a Sunday?! Going out for breakfast wasn’t actually something I ever used to do until earlier this year. I guess I got bored of evening meals in the same restaurants, and with so many places that serve breakfast in Plymouth, it’s definitely something I look forward to on the weekend. A sunday well spent brings a week of content right? Especially when it involves fluffy pancakes and copious amounts of tea! You’ll probably be like ‘surely this is just the best places for pancakes in Plymouth?’ I like pancakes, OK? But I think it still gives you an idea of how nice their other breakfasts are too, and if you like pancakes you’re onto a winner with this post! 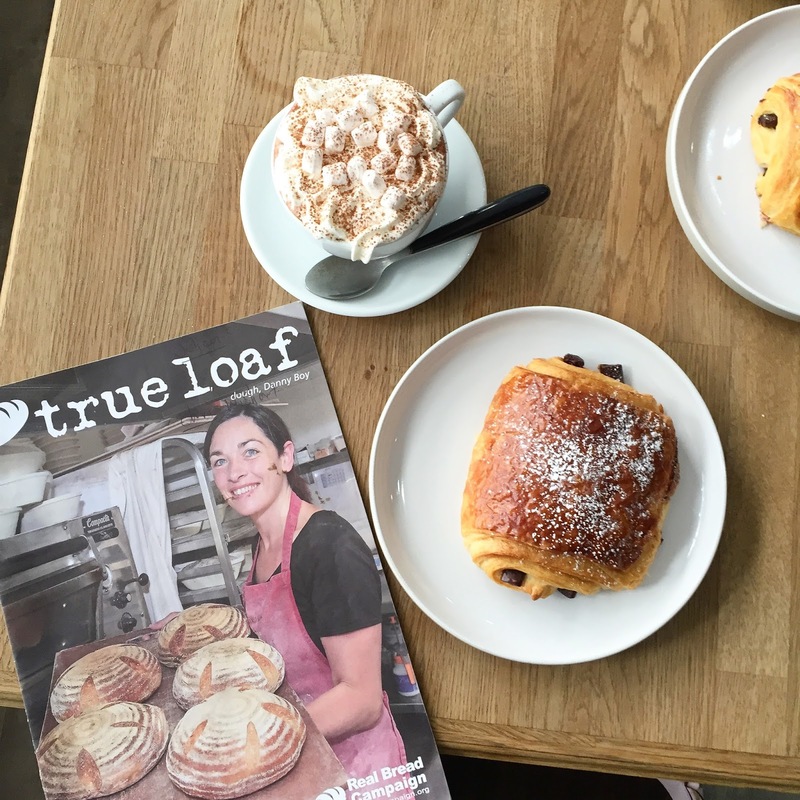 If you’re a local, new to the area or popping down for a holiday, this really is the definitive list of the best places to tuck into breakfast in Plymouth! I write this with a solemn heart, as unfortunately The Bakery shut down about 2 weeks ago, which is so sad as I loved the concept of The Bakery, the location and the delicious breakfast pastries. Even though it has closed, I’m still including it as I’m holding my hopes out that they may reopen again? The Bakery served up a fine selection of pastries and a selection of hot dishes, you just help yourself, get your drinks, and pay at the end – it’s really that simple! Think croissants the size of a dinner plate and pain au chocolats oozing with chocolate, and the atmospehere of this place is the best bit, set in the heart of the industrialised buildings of Royal William Yard, I’m certainly sad to see this place go. 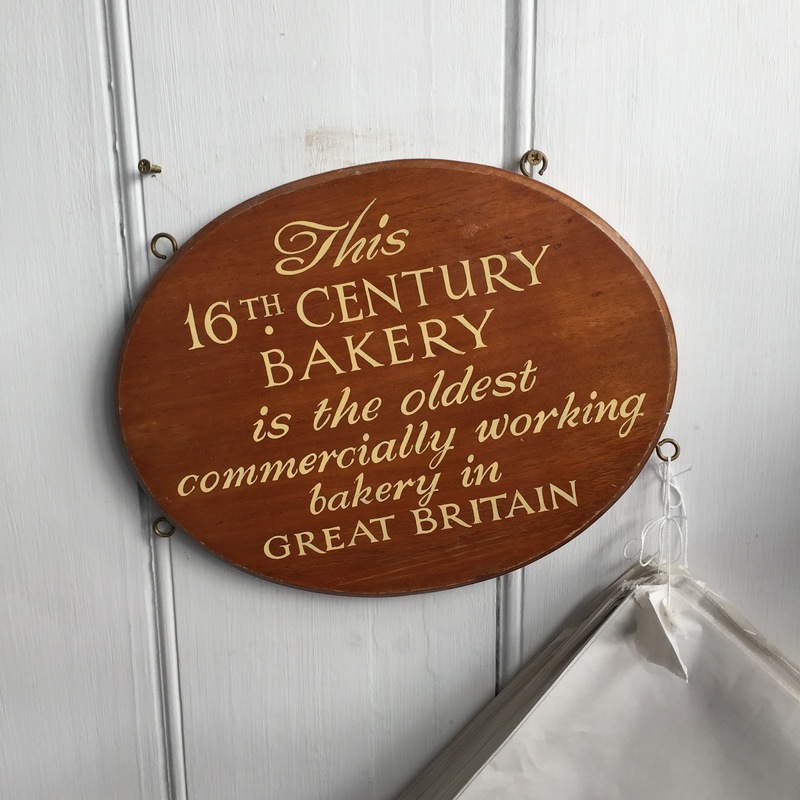 There’s proof that I really do love this place so much as I devoted a whole post to The Bakery a couple of years ago! You’ve probably come across a BTP Cafe somewhere on your travels, and I know it’s not an independent restaurant, but they have that quirky edge, industrial interior and a breakfast menu to die for. There is plenty of seats both inside and outside, so you don’t need to worry about it being full up on a Sunday morning. I’ve had porridge and pancakes in BTP Plymouth, and they were both delicious. They definitely cater to those who want to have a nice breakfast out that is still healthy. There’s lot of different toppings that you can choose for your porridge too, so it definitely makes it more exciting than your every day porridge routine at home. Situated in the ferry port, The Dock has a delicious brunch menu and breathtaking views. I would recommend visiting on a sunny day as you can also sit outside and take in the stunning sea views. Their menu caters for everything, from healthy granola dishes and pancakes, to full English breakfasts. The granola comes with yoghurt and fruit that is more filling than you would think. I was a little pig and got a croissant to go with it too! They also have a Danish basket which only costs £5 and is filled with lots of yummy, buttery pastries – you can’t really go wrong with that! I’ve lost count of the amount of times that I have proclaimed my love for Rumpus Cosy. It goes without saying that it is my go to place for tea, cake and a little bit of peace and quiet. Situated in the city centre, you can’t miss Rumpus Cosy and it’s the perfect place to grab some brunch on a Saturday morning. They only started serving breakfast earlier this year and their compact offering really works. I of course stick to the pancakes in Rumpus Cosy as they’re insta friendly (OBV) and they taste amazing. It’s nice to be able to get traditional pancakes for once as most places just serve American style pancakes which don’t get me wrong I also love! The prices are pretty reasonable for a delicious brunch and I couldn’t think of a better place to start the day! Royal William Yard is actually home to 3 of the places mentioned in this post, the yard really is the place to be when the weekend comes around. Whether you want some tea and cake, breakfast or an evening meal, Seco Lounge caters to everything and there is plenty of seating inside. Like most restaurants in the yard, they still have the original stone walls, and high ceilings – filled with lots of cosy chairs and wooden tables that are perfect for flatlaying your food! The pancakes at Seco Lounge are some of my favourite, and they’re not the type that make you feel sick from feeling so full afterwards! You can find Monty’s on the cobbled streets of the Barbican which has been a favourite among people in Plymouth for years. Don’t get me wrong, I absolutely loved Monty’s, but it’s not the place for you if you’re looking for a dish that’s instagrammable. I may sound obsessed, but this is a big deal for me. The lighting, table and presentation of the dish is imperative to me, as well as how it tastes!If you like full English breakfasts then you’ll love Monty’s, and I hear they’re a great hangover cure! I actually love the pancake/bacon combo and this was the first place that I actually tried it. Presentation skills for me were a 3, but the pancakes were delicious, and I would definitely recommend. Bistrot Pierre was one of my favourites for pancakes, it was also the first time I’d ever tried out this restaurant and it’s definitely the slightly more upper class, refined place for breakfast. It’s not all about full english breakfasts here! Situated in the historic Royal William Yard, we had one of the best seats by the window and I could have stayed there all day watching the world go by. As far as drinks go, tea and coffee are such a great choice as they offer unlimited refills, really justifying being able to take your time and relax with your breakfast. 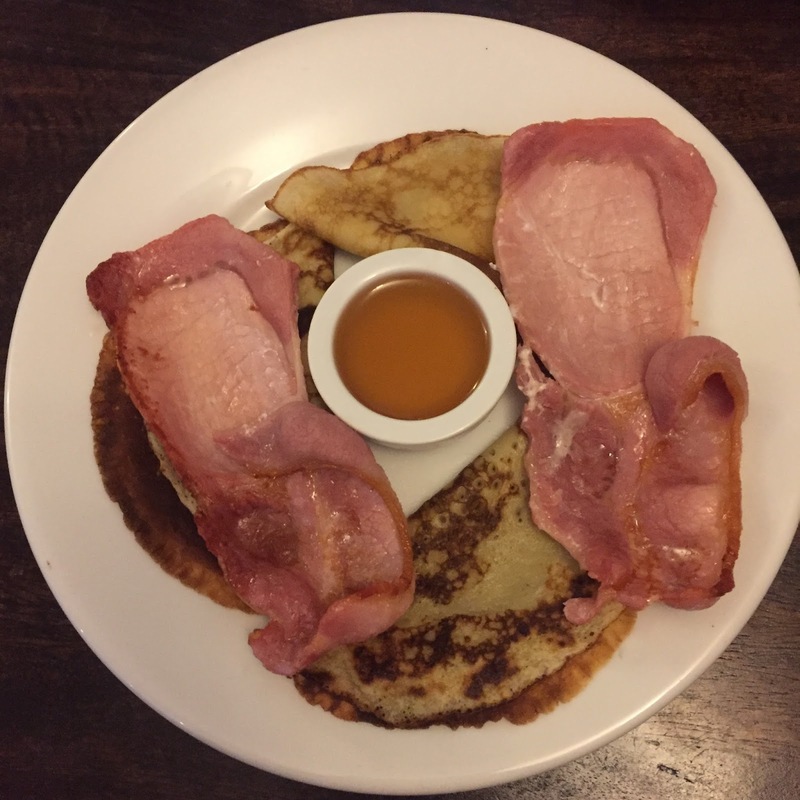 The pancakes were beautifully presented and they even brought out a massive jug of maple syrup which a lot of other restaurants don’t offer unless your pancakes come with bacon! Rocksalt was one of the first places that I sarted on my breakfast tour of Plymouth, and of course in true fashion I started off with their American pancakes that I had heard so much about. Rocksalt is really tucked away, I didn’t even know it existed until I started seeing rave reviews about the restaurant. It also has a sister restaurant in Plymouth called Salumi. They have an extensive breakfast menu with lots of hot options. Hats off to Rocksalt for creating such an insta friendly restaurant, table setup and presentation of the food was spot on. The American pancakes were like nothing I had ever tried before, the stack of 3 was wayyyy too much for me too eat as they were almost thick enough to be doughnuts! Despite being defeated, I’ll definitely be popping back, but maybe to share a stack next time? 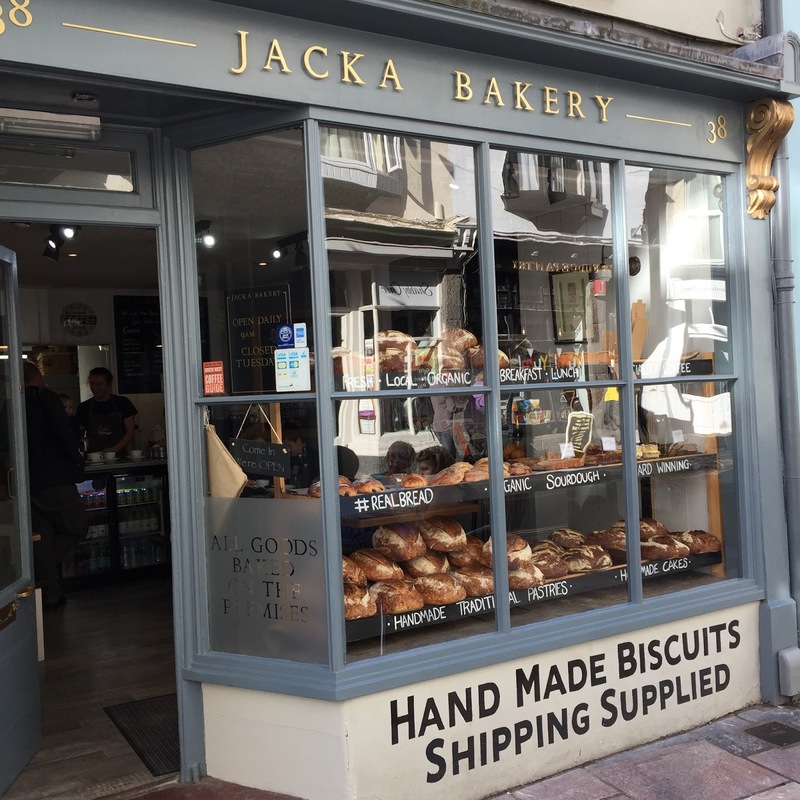 Oh Jacka Bakery <3 I have been meaning to visit this quaint little bakery on the Barbican for quite some time, it is in fact the oldest commercially working bakery in Great Britain, and I just love the history, charm and character that this bakery has. As expected, they have quite a selection of homemade breads, cakes, pastries and a few hot breakfast dishes. It was a similar selection to The Bakery and I went for a fail safe hot chocolate and pain au chocolate, a winning combo for a cold Sunday morning. Jacka Bakery is very small inside with only a few tables, they also recommend coming early during the day as their produce sells out quickly, which is no surprise when they’ve built up a fantastic reputation in Plymouth, and their baked goods are second to none. This was one of my favourite places for breakfast, as it really offered it all. So simple, SO tasty and tucked away in one of my favourite places in Plymouth. So there we have it, 10 of the best places for breakfast in Plymouth, what a great bunch! I think it’s important to point out that I wasn’t sponsored or invited to any of these to review, I generally just love trying out and discovering new places in Plymouth, and I loved writing my best cafe’s post so much so that I wanted to delve into the brunching world, and boyyyy do I love it! I love how Plymouth is home to some of the cutest and most quaint places for breakfast, and it’s even better when it’s in the sun on a Sunday morning, Plymouth really is rather special isn’t it? Have you been to any of these places before? Do you have any other recommendations for places to eat breakfast in Plymouth?